She might be a Grammy Award winning recording artist but Erykah Badu certainly likes to keep it real. 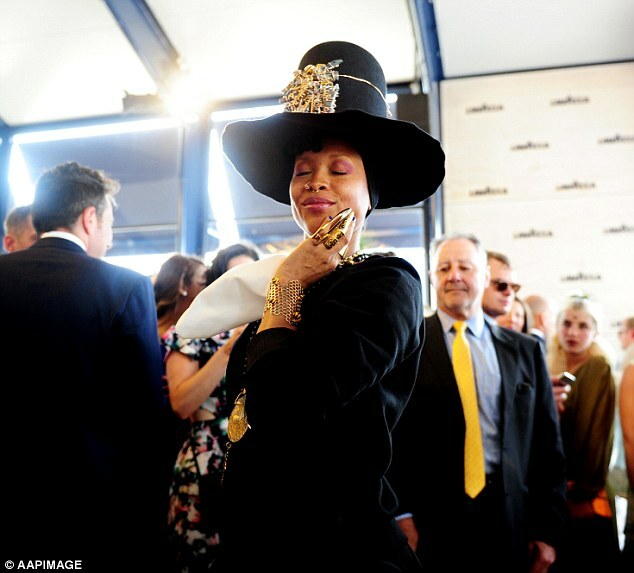 The music legend, who caused a stir when she was seen busking on a busy New York street earlier this month, might have been in a VIP enclosure at Melbourne Cup on Tuesday but that didn’t stop her from going barefoot. 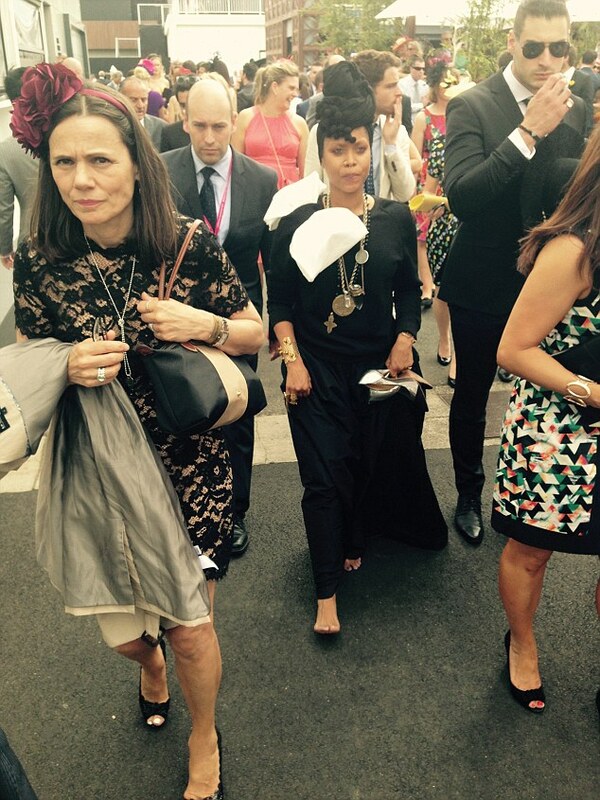 While this might be a regular scene in the main area of the Flemington during the course of the long day after a few drinks, super cool Erykah didn’t look like she cared about what anyone thought in the VIP area as she comfortably strolled along. With her glamorous silver and black stilettos in her hand Erykah looked almost dwarfed amongst the other party goers who still had their shoes on. In Melbourne to make a special guest appearance at the Lavazza marquee at the racing day, she told Daily Mail Australia last week that she may take her ten gallon busking hat and try her luck Down Under. ‘Maybe! It’s actually a good idea,’ she laughed when asked on Monday if she intended to repeat her street-side display. ‘I didn’t have any plans but actually I didn’t even plan [what I did in New York]. ‘It was very spur of the moment, it just came out of my mind! I’ve always wanted to do an experiment like that, but it was pretty much comic relief for me and my crew. She also mentioned how ‘excited’ she was to touch down in the Victorian capital and attend the races for the first time. ‘I’ve heard the races are very fashionable and pretty popular among the elite,’ she said. 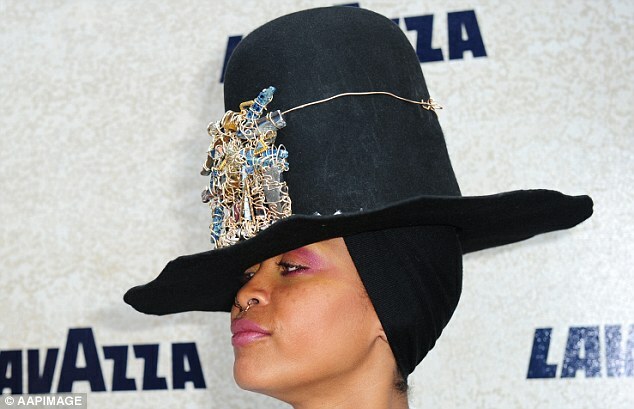 However unlike many stars, Erykah, who has son Seven, 16, and daughters Puma, 10, and Mars, five, opted to organise her outfit without too much of a plan, instead saying: ‘I like to play it by ear’.